About 5 years ago, I read a life changing book called Clean, by Dr. Alejandro Junger. Since then, I have tried to live my life and eat according to this book. As Spring is here, there is no better time to get "clean" then now. We put so much "garbage" in our bodies, and we are exposed to so many daily toxins, we need something to help us get rid these. I know its easy to eat unhealthy, but how do you feel afterward? Usually like crap. Make the extra effort, eat healthy. It takes a lot of work, but give your body the good energy it needs. There is no better way to get on the right track after the long dreary winter than with Dr. Junger's 21-day program. You will feel so rejuvenated! Read the above interview with Dr. Junger about clean eating. Also, I'm very excited for his new book to come out next week with contributing recipes from Gwyneth Paltrow, Dr. Oz and Cameron Diaz! I pre-ordered mine with 100% of author proceeds goes to a charity. Dr. Junger: Have you noticed that more and more people are less comfortable using rigid definitions to describe how they eat (i.e. paleo, Atkins, mediterranean, vegetarian, raw, etc.)? We take some ideas from one way of eating, some other ideas from somewhere else and we create a personalized plan that works for each of us. That’s the idea behind clean eating. It’s not a dogma, diet, or a set list of foods that are deemed good or bad. It’s not a restrictive diet or “rabbit food” as some critics like to call healthy eating. It’s really a way of looking at food. I like to imagine clean eating as a pair of glasses that lets you make sense of the food options around you. My team and I have described exactly what a whole food is and how to discover your toxic triggers here (PDF). How is clean eating different from the latest diet trends (i.e. paleo, raw foods, South Beach, mediterranean)? Dr. Junger: Clean eating is broader than most diet trends. We’ve found that some people do better on a mostly vegetarian diet, or some people do best with good amounts of animal protein. Some do grains, some people don’t. Whatever diet is God’s gift for one person, may very well be a stomach ache for another. So unlike any diet, clean eating does not have a set list of foods to eat. We focus on our minimalist definition, whole foods minus toxic triggers, and then begin personalizing from there. You say this isn’t a diet, but all of your programs have a set list of foods? Dr. Junger: This is absolutely true. Each program I have created, whether it is a cleansing program or a gut repair program, has a list of included and excluded foods. The list is your “prescription” for the duration of the program. But when we follow a program we are doing it with a specific purpose in mind (cleansing, gut repair) and for a specific period of time. They are not meant to be followed all the time. If they were, we would run into all the same problems that occur when people try to follow a diet long term. It rarely works. Restrictive diets can never give us broad enough choices to account for how we actually eat or want to eat throughout the year. Which is why most people who diet to lose weight tend to gain it back and then some. “Clean eating” is not a program or diet. It’s a way of thinking about our food choices. And you can easily begin by eating whole foods minus your toxic triggers and continuing to pay attention to how your body responds. Over time, your body may respond differently to certain foods and you can adapt accordingly. In my new book, Clean Eats, I have chosen to remove dairy and gluten because my clinical experience has shown me that these are the foods that most often give people trouble. Gluten has been connected to an almost endless list of health problems and dairy tends to create mucus, skin issues, and fatigue. That said, it may not be necessary for you to exclude these items all the time, but I recommend that you do test them by doing a cleanse to discover if they are a trigger food for you. This sounds good, but can I really eat this way long term? Dr. Junger: I understand your concern. We’ve all been affected by the diet mentality. This is the idea that there is one way or a perfect way to eat and if we do this all our problems will be solved. Whenever most of us, myself included, try to stick with these “perfect” plans, we fail, mostly because they are unrealistic and too restrictive. We may feel better at first but then end up feeling worse over time. This is why it’s hard to believe you can eat this way long-term. Clean eating is different than this. It’s not about perfection. There is no perfect diet, no magic bullet that will bring us to health heaven. Rather, there are open principles that can inspire us to stick with foods that have been proven to help us feel better. For me, that means whole foods minus your toxic triggers. Dr. Junger: I’m the first to admit that I’ve created my programs to help me with my own health problems. I use the Clean Cleanse, Clean Gut, and Refresh programs regularly to get myself back on track because I do eat foods that don’t always make me feel great. I definitely do not always follow my own advice. Probably my two biggest challenges right now are eating too much sugar and eating too quickly. I’m bringing as much awareness as I can muster in order to change them but it’s a slow process. One of the ways I work with these issues is to be a part of a community of people interested in clean living. Spending time with family and friends who have a habit of eating clean is the simplest way for me to keep on track and feel good. Dr. Junger: This is a great question and an important one. It’s something that I go into in Clean Eats. Sure, if we compare the immediate cost of eating cheap processed foods versus the cost of whole foods, there is a difference. But that’s only part of the story. The other side of the story is that getting sick is very expensive. In fact unpaid medical bills are the number one cause of bankruptcy today. Changing the food we eat is the number one action we can take to maintain our health long term. The second point is that most of the expensive health foods are boutique foods. These are your kombuchas, raw food bars, and specialty cakes and cookies. Whole fruits, veggies, greens, fish, meats, eggs, sweet potatoes and non-gluten grains, some of the items on a whole foods diet, are not the foods that tend to drive up the cost at the register. That’s why Clean Eats focuses on basic whole foods you can find anywhere. We have some fun specialty foods in there like maca or coconut water, but none of these are essential items, just ones to use on occasion. Can you tell us a little more about Clean Eats and why you wrote it? 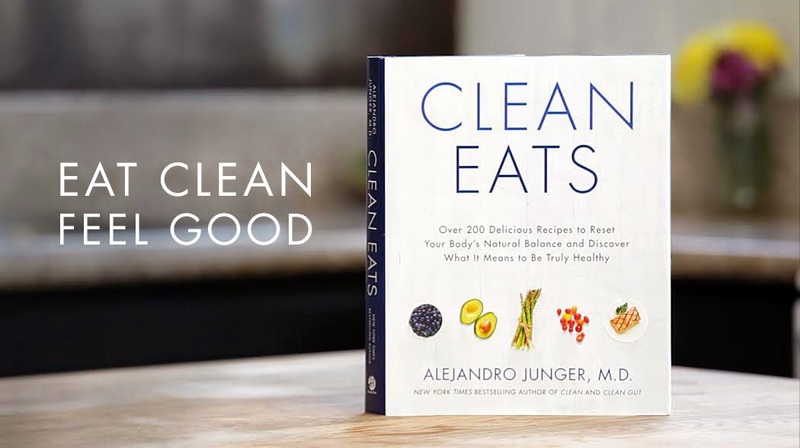 Dr. Junger: Well, first, this is the kind of book the Clean community has been requesting for years and for good reason. The Clean Eats recipe book is the foundation for all the programs and books I have created so far. Whether you are talking about the power of cleansing in my first book Clean or the power of gut repair in my second book, Clean Gut, the foundation is the type and quality of the food you eat. And that’s where Clean Eats comes in. The book gives you so many incredible healthy recipes that you can use for the rest of your life. I really feel that the most important tool in our wellness toolbox, is our own kitchen. What you make in your kitchen, when made with clean foods, is the medicine we need today. So it made perfect sense to me that a doctor like myself would create a recipe book. It almost feels like a responsibility. Will this book turn me into some health obsessed, stressed out person? Dr. Junger: I hope not! I know that it is easy to get stressed out about our health. Many of us feel lots of symptoms from digestive issues to fatigue to skin problems. And many of us are also aware that we live in the most toxic time in the history of the world. So, it is important to give attention to our health and what we eat. But obsessing over it can quickly backfire. All the stress creates even more problems. I like to take a step back and ask myself, “Why are we doing all this?” Yes, we want to reduce the probability of chronic health issues, but I think there is another reason, and this reason can keep us from getting stressed. The reason I give attention to my health is that I want to live more. This means I want the energy and joy so I can show up more for my family, spend more time with my kids, and do all things I've been planning to do. And I want my health to be a foundation for that. I give it my focus from time to time, so I don’t need to focus on it all the time. That’s what I love about the Clean Eats book.The recipes are amazing and delicious and they all have the whole foods approach already built in, so you don’t have to spend time analyzing each recipe. Dr. Junger: I’m interested in hearing from our community what you think about the book when it’s released on April 29th and what are your most important wellness questions. The interaction with everyone who has done one of our programs and who lives clean is one of my greatest joys. It’s what motivates me in my own life and in developing tools to inspire you to live clean.